Tumors of the central nervous system are common in the pediatric population. However spinal tumors constitute only 1-10% of all pediatric central nervous system tumors. , Pediatric spinal schwannomas/neurofibromas constitute 2.5-4% of all pediatric spinal tumors. They are firm encapsulated benign tumors and total surgical removal can be achieved in most of the cases with an excellent outcome. The study included 21 patients in the pediatric age group (<18 years) of spinal schwannomas who underwent surgery over 10 years from January 1998 to April 2008 in the Department of Neurosurgery, National Institute of Mental Health and Neurosciences, Bangalore. Case records of these patients were reviewed retrospectively. The demographic profile, clinical features, radiological findings, operative procedures, postoperative complications, and outcome were noted and analyzed. Follow-up data were analyzed and average duration of follow-up noted. There were a total of 21 patients with an age range of 6-18 years with a median age of 16 years. There were 14 females and 7 males (ratio of 2:10). The duration of symptoms ranged from 1 month to 36 months with average duration of 5 months. The predominant complaint was progressive motor deficits seen in 86% of patients. Localized pain was seen in 67% of patients. Six patients had bladder disturbances (29%) and six patients had associated neurofibromatosis. Among these, five had neurofibromatosis type I with multiple café-au-lait spots and multiple subcutaneous swellings, and one had neurofibromatosis type II with bilateral vestibular schwannomas. One patient had presented with spastic quadriparesis with severe breathing difficulty. This patient underwent emergency decompression of the tumor and was put on ventilator. Gradually the patient was weaned off from the ventilator support and made significant improvement. 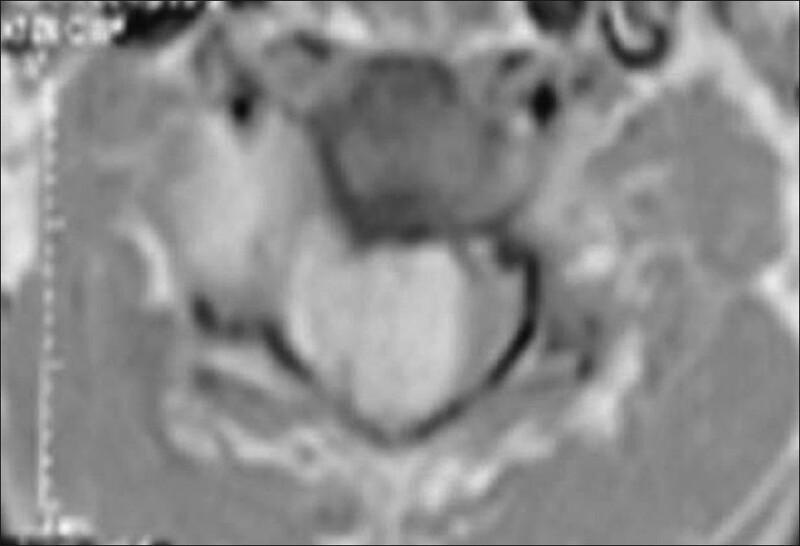 The predominant location was the cervical region in 10 cases (47%), followed by dorsal in 8 cases (38%). In three patients, the tumor was located in the lumbosacral region. Four of the 21 patients had dumbbell schwannomas. Among the 21 patients, 18 underwent laminectomy, 3 underwent laminotomy and microsurgical excision of the tumor. Twenty patients underwent gross total excision and one underwent partial excision in view of tight adherence to multiple nerve roots in cervical region. Two patients had significant anterolateral extraspinal extension. Hence, they underwent an additional anterior approach and gross total excision. All the patients made gradual improvement in the power. None of the patients deteriorated in power following surgery. One patient had developed wound infection, which was controlled with relevant antibiotics. One patient had developed meningitis that was managed with appropriate antibiotics. Both patients made a gradual improvement. The follow-up period ranged from 4 months to 56 months with average follow-up period of 38 months. Motor deficits improved by at least one grade in 6 patients and by 2 grades in 10 patients. Two patients had remained status quo in motor power. Of the six patients who had bladder symptoms, four patients made improvement in urinary symptoms and two patients were on intermittent self-catheterization. X-rays of the spine was performed at follow-up and showed no signs of instability in any of the patients. Follow-up MRI at last follow-up revealed no recurrence in any of the patients. In our study the most common location was the cervical region (47%) followed by the dorsal region in 38% of the cases [Figure 1]. This differs from the available literature in which the majority of the tumors are located in the cervical and lumbar regions. ,, According to the available literature 70--80% of spinal schwannomas are intradural in location and those extending through the dural aperture as the dumbbell mass involving both intradural as well as extradural space account for another 15%. Intramedullary schwannomas are extremely rare. , In our study, 17 patients had intradural schwannomas (80%) and 4 patients (20%) had dumbbell schwannomas. All our patients underwent surgery and excision of the tumor (GTE in 20 and STE in 1); [Figure 2] and [Figure 3] the outcome is comparable to the available literature and correlates with the preoperative neurological status of the patient. 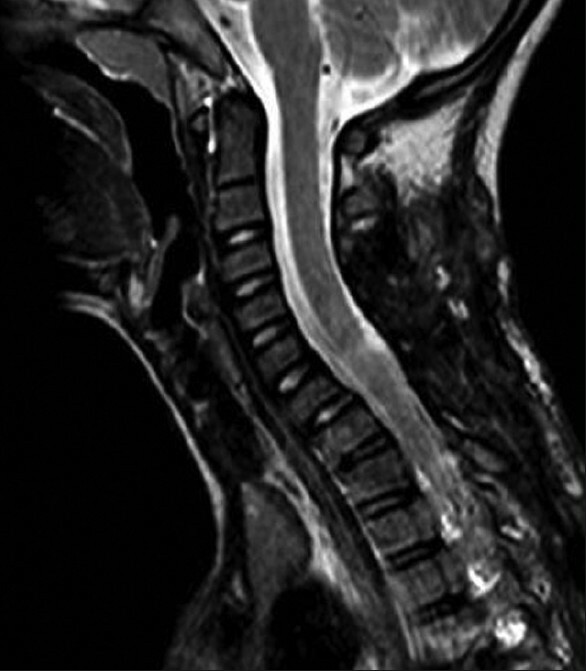 Spinal schwannomas are rare among the pediatric population. Though histologically benign they can produce profound neurological deficits. Microsurgical excision for spinal schwannomas usually results in good postoperative functional outcomes. 1. Loh JK, Lin CK, Hwang YF, Hwang SL, Kwan AL, Howng SL. Primary spinal tumors in children. J Clin Neurosci 2005;12:246-8. 2. Wilson PE, Oleszek JL, Clayton GH. Pediatric spinal cord tumors and masses. J Spinal Cord Med 2007;30 Suppl 1:15-20. 3. Dorsi MJ, Belzberg AJ. Paraspinal nerve sheath tumors. Neurosurg Clin N Am 2004;15:217-22. 4. Rodriguez D, Poussaint TY. Neuroimaging findings in NF type 1 and 2. Neuroimaging Clin N Am 2004;14:149-70. 5. Klekamp J, Samii M. Surgery of spinal nerve sheath tumors with special reference to neurofibromatosis. Neurosurgery 1998;42:279-90. 6. Selosse P, Granieri U. Spinal intradural meningiomas and neurinomas. Review of the literature and current situation. Neurochirurgie 1968;14:135-54. 7. Seppala MT, Haltia MJ, Sankila RJ, Jaaskelainen JE, Heiskanen O. 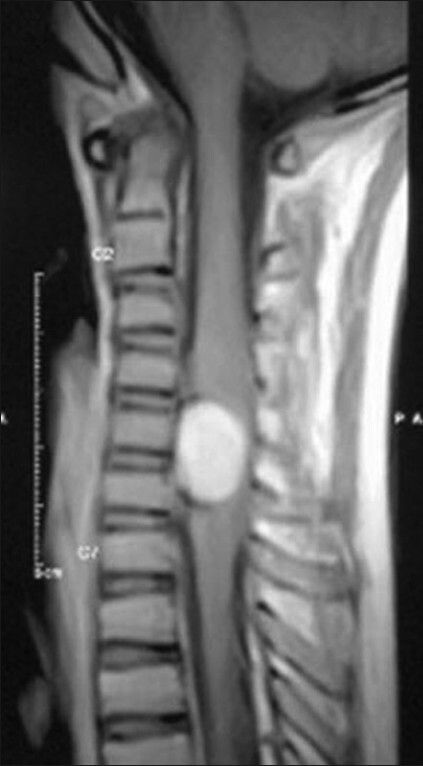 Long-term outcome after removal of spinal schwannoma: A clinicopathological study of 187 cases. J Neurosurg 1995;83:621-6. 8. Jeon JH, Hwang HS, Jeong JH, Park SH, Moon JG, Kim CH. Spinal Schwannomas: Analysis of 40 Cases. J Korean Neurosurg Soc 2008;43:135-8. 9. Conti P, Pansini G, Mouchaty H, Capuano C, Conti R. Spinal Neurinomas: Retrospective analysis and long-term outcome of 179 consecutively operated cases and review of the literature. Surg Neurol 2004;61:34-43. 10. De Verdelhan O, Haegelen C, Carsin-Nicol B, Riffaud L, Amlashi SF, Brassier G, et al. MR imaging features of spinal schwannomas and meningiomas. J Neuroradiol 2005;32:42-9. Mohanty, C.B., Rao, K.V.L.N., Sampath, S.